RTDAQ is Campbell Scientific's datalogger support software targeted for high-speed data acquisition applications. This versatile software supports a variety of telecommunication options, manual data collection, and extensive data display. 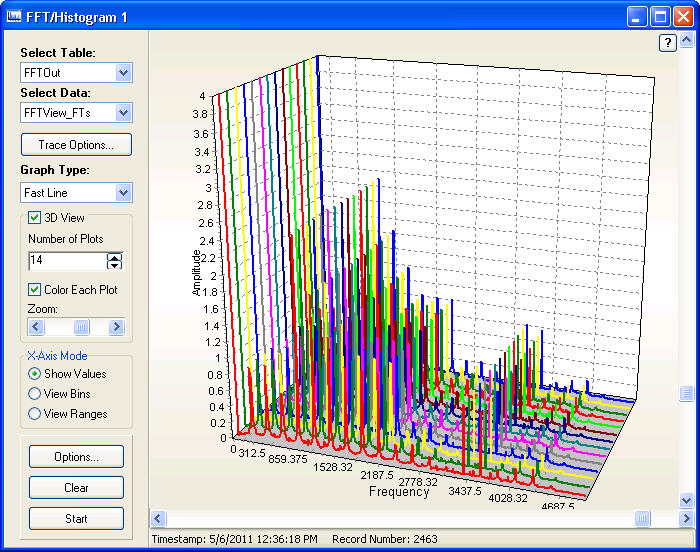 RTDAQ includes easy-to-use program generators, as well as full-featured program editors. RTDAQ is available on our website. RTDAQ does not support combined communication options (e.g., phone-to-RF) or scheduled data collection; LoggerNet is recommended for these applications. To facilitate station setup, RTDAQ provides an EZSetup Wizard. This simple, station-oriented wizard walks the user through the setup process. The wizard can also be used to modify settings for an existing station. These tools are used to set a data logger’s clock, send programs from the computer to the data logger, display real-time data logger measurements in several different formats, and collect data on demand. 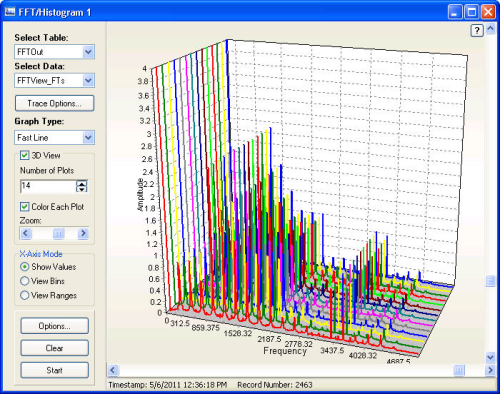 RTDAQ provides a choice of programming tools. Short Cut (SCWIN) is an easy-to-use program generator that creates straight-forward programs in seven steps. It supports over 100 sensors (including generic measurements) and multiplexers. ProgGen is an updated version of the detailed program generator contained in PC9000 software (RTDAQ’s predecessor). ProgGen contains many measurement and setting windows for configuring almost any type of sensor. It is compatible only with the CR5000 and CR9000X dataloggers. The CRBasic Editor provides sophisticated program editing capabilities. Programs generated by Short Cut and ProgGen can be edited in CRBasic. View Pro lets you view data files (*.DAT files) in a tabular format. It can create graphs that display multiple traces of data. View Pro also supports the viewing of specialized data storage such as FFTs and histograms. RTMC is used to create customized displays of real-time data, flags, and ports. It provides digital, tabular, graphical, and Boolean data display objects, as well as alarms. Sophisticated displays can be organized on multi-tabbed windows. Users who want additional capabilities and more flexibility can purchase RTMC Pro—an enhanced version of RTMC. DevConfig allows you to send new operating systems to data loggers and other devices with flash memory, configure various PakBus settings in data loggers, and edit settings for communication peripherals such as the NL201 and RF401A. In the Tools pull-down menu, you can select LogTool and PakBus Graph. These tools can help you discover the cause of communication problems. CardConvert is used to convert and save binary data from a PC Card, CompactFlash card, or microSD card. PC Cards are compatible with our CR5000 and CR9000X dataloggers. CompactFlash cards are compatible with our CR1000, CR3000, CR5000, and CR9000X dataloggers. MicroSD cards are compatible with our CR6 and CR1000X dataloggers. Split is used to post-process data files and create reports. It sorts and combines data based on time or conditions, performs calculations on data values, converts “Day of Year” calendar dates into more traditional date/time stamps and allows variable column widths for printable reports. The purchase of this software allows you to install and use a single instance of the software on one physical computer or one virtual machine only. RTDAQ software may not be sold, included, or redistributed in any other software or altered in any way without prior written permission from Campbell Scientific. RTDAQ is available as a download from our website. This patch will upgrade RTDAQ version 1.0, 1.1 or 1.2 to 1.3. RTDAQ 1.x must be installed on the computer. If a facility has ordered the RTDAQ software but wants to start using it right away, can a copy of the software be downloaded from the Campbell Scientific website? A fully-functional 30 day trial version of RTDAQ is available for download free of charge. The trial version may be installed and used until the ordered software arrives. After the ordered software is received, run the installation again. This time, when prompted, supply the software key to unlock the fully-licensed version.